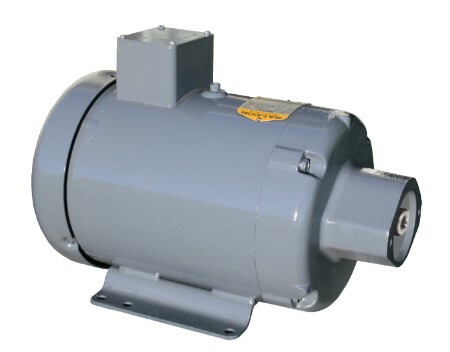 BALDOR - Spec: 37G421X276, Spec: 37F226W706, Spec: 37F169Z50 ..
Motor Shaft: with 3/4" ID counter-bore. 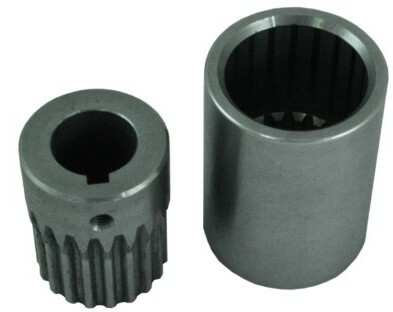 YZ mounting face: for direct mounting of SAE-A pumps. Pump mounting holes are 4.18" on center. Threads 3/8" x 16 tpi. Electrical junction box: top mounted. This new 10 hp motor can be used to replace 5 hp & 7.5 hp motors with the 215YZ frame and also the AVO215 frame. (These motors are no longer available. 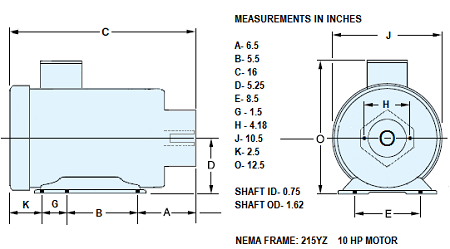 See NEMA frame dimensions in diagram above.) In most cases, the motor mounting holes & the shaft of this new 10 hp motor will line up with the original motors. If the new motor replaces a smaller motor, then the Motor-starter should also be upgraded. The splined-coupling used with earlier versions of this motor, is no longer needed. This new motor shaft is counter-bored to directly accept a keyed 3/4" pump shaft. 10 Hp Baldor Motor, Frame: 215YZ, Shaft ID 3/4"